At the Artisan Studios in the Historic Garrison District in downtown Fredericton, New Brunswick, there are many small shops situated in the buildings displaying their handcrafted goods. 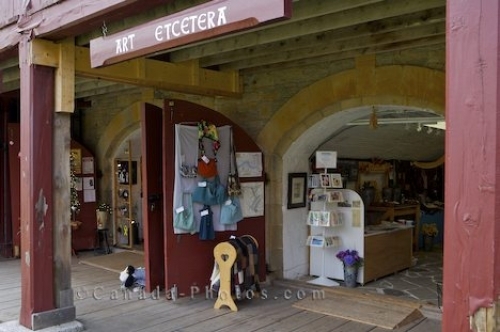 In each shop, there are a wide selection of items to browse through, all which have been created by skilled artists. Artisan Studios in the Historic Garrison District National Historic Site in downtown Fredericton, River Valley Scenic Drive, Highway 2, New Brunswick, Canada. Photo of the Artisan Studios housed in the historic buildings in downtown Fredericton, New Brunswick.